Cut chicken into 2 x 1/2 inch strips. Mix egg, flour, 2 tablespoons cornstarch, 2 tablespoons water, the salt, 2 teaspoons oil, the baking soda and white pepper; stir in chicken. Cover and refrigerate 20 minutes. Mix 1/2 cup water and 1/4 cup cornstarch. Heat sugar, broth, vinegar, soy sauce, chili sauce, 1 teaspoon oil and the garlic to boiling. Stir in cornstarch mixture; cook and stir until thickened. Remove from heat; keep warm. Heat oil (1 1/2 inches) in wok (I don't have a wok, I used a large pan) to 350. Pull noodles apart gently. Fry 1/4 of the noodles at a time 5 seconds or until puffed, turning once; drain on paper towels. Heat oil to 350 degrees. Fry about 10 pieces of chicken, adding 1 at a time, 3 minutes or until light brown. Remove from oil, using slotted spoon; drain on paper towels. Repeat with remaining chicken. Heat oil to 375. Fry about 1/3 of the chicken 1 minute or until golden brown. Remove from oil, using slotted spoon; drain on paper towels. Repeat with remaining chicken. Place chicken on heated platter. Heat sauce to boiling; pour over chicken. Sprinkle with sesame seed. 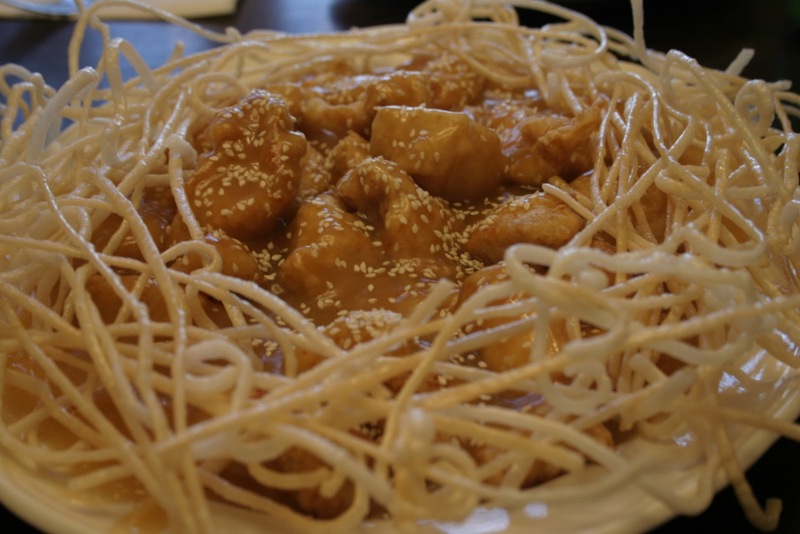 Arrange rice stick noodles around chicken. Spray wok or 12-inch skillet with nonstick cooking spray; heat until hot. Add ginger root and garlic; stir-fry about 1 minute or until light brown. 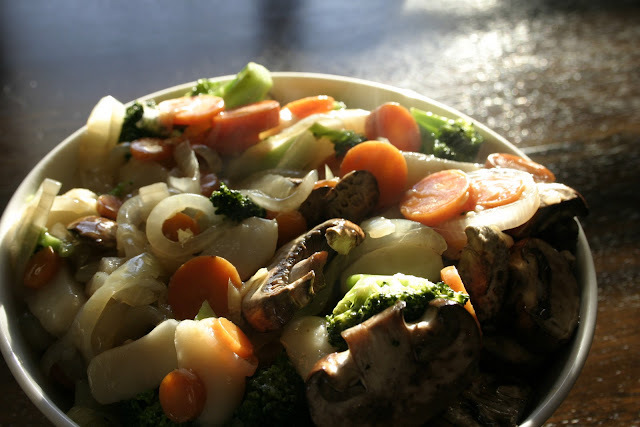 Add broccoli, carrots and onion; stir-fry 1 minute. Stir in broth and salt; cover and cook about 3 minutes or until carrots are crisp-tender. Mix cornstarch and cold water; stir into vegetable mixture. Cook and stir about 10 seconds or until thickened. Add water chestnuts, mushrooms and oyster sauce; cook and stir 30 seconds. Yum I love stir fries, yours looks delicious! Thanks Chris! I was happy to be back in my kitchen making dinner for my family! I love love love searching for used cookbooks! One of my favorite recipes I found curled up in an old book at goodwill. Stirfry looks wonderful by the way! Looks great Dee!!! Now find a chop suey one and have your dad over!!! Thanks Sarah! I was looking through the Candy cookbook that I bought and found a very old recipe that the previous owner had forgotten folded up inside. It looks like it was typed up on a typewriter and it's very yellowed. It's for Divinity. Looks like I will have to try making Divinity soon. Thanks for stopping by!